As of September 15th, the parliamentary situation in Sweden is still unclear, as both the so called center-right and center-left blocs claim victory in the elections, while at the same time, aim for the establishment of new alliances. Aside from the established blocs, the xenophobic Sweden Democrats managed to increase their share of the vote to almost 18 percent. It still remains to be seen what alliances and pacts will be formed. What we can say, is that the present situation will mean that the attacks against the working class will harden. Regardless of the constellation of the government, all parties have announced various measures aimed at the working class. Most apparent is the attack against the right to strike, where all parties, with the exception of the Left Party, maintain that new limits to what that right currently entails are necessary. Before the elections, the Left Party promised that they would withdraw support for the Social Democratic government if it went through with the attacks on the right to strike. Comfortably for them, they never had to live up to their promise, as the attack was postponed until after the elections, and they could continue to fulfill their role as a left-wing alibi of capitalism. In the refugee question, they fulfill the same function. They criticize the migration policy of the Social Democrats loudly, but never go beyond a verbal critique. In this way, they succeed in catching dissatisfied social democrats and ordinary people to channel their anger back into a support for the same Social Democrats. The Center Party and the Liberals have other roles to fulfill. As traditional parties for the Swedish petite-bourgeoisie and the clearest representatives of the middle strata they have ferociously attacked the labor unions. A couple of years ago, the Center Party was behind a campaign called “F*ck the unions 4-ever” in support of small-sized companies which refused to sign collective bargaining agreements. Small-sized companies often have tiny margins and do not have the same possibilities to give workers concessions. In light of this and in line with their interests, both parties aim to introduce so called “entry level jobs”, where newly arrived migrants are supposed to enter the labor market with a new lower level of salaries and with state subsidies directed towards the employer. Workers in this situation would be used as a sledgehammer against the benefits and rights that the Swedish workers have fought for and undermine them – this must be met with more powerful organizing as well as a clear focus on class, not ethnicity. The last couple of decades have seen a concerted effort from the monopolies, media and all the parties to turn the public discourse in Sweden away from class, and towards ethnicity and culture. This has enabled the Sweden Democrats to claim larger and larger parts of the support of the Swedish voters, not least among the workers, where about one fourth of all workers that voted, gave their support to the Sweden Democrats. This is a large increase since the last elections, and it is a big problem for the Swedish communists, which so far has not been handled in the correct way. In short, the only way to weaken the Sweden Democrats, is to force focus back onto class, away from ethnicity and culture, which is possible through exposure of their anti-worker character. We know that the basic contradiction in society is that between labor and capital – when combating neo-fascism, climate change, and all other problems that are unavoidably intertwined with the capitalist system, this must be at the center of our analysis. In that context, the Greens were almost kicked out of parliament by the voters as they have in all but their name given up everything that has to do with the protection of the environment. When the government made arms and coal energy deals worth billions of Swedish Crowns, the Greens were “very critical” – which is the height of irony, seeing as the Greens were part of the very same government. Their conduct was similar when the government announced harsher measures against primarily juvenile Afghan refugees. The leader of the Greens cried on the press conference, when the government announced the measures they themselves had negotiated as part of the ruling coalition. If they previously had a function similar to that of the Left Party, i.e. to channel dissatisfaction and radicals back into a support for the environmentally hazardous capitalist system, this function has been weakened. It remains to be seen if they can recover. The largest party in Swedish politics, the Social Democrats, lost support in almost all municipal districts. Partly, this has to do with the fact that the Social Democrats no longer have a role to fulfill as a bulwark against communism. In present day Sweden, there is no revolutionary threat against capitalism and the tying up of workers to the capitalist system is a role that is increasingly performed by the Sweden Democrats. This is one reason for the worst electoral performance of social democracy in Sweden since 1911. The major conservative party, the “Moderates”, that also lost support in the elections, are joined by the Christian Democrats on the right wing, and have together been approached by the Sweden Democrats in an attempt to form a government. Both the Moderate Party and the Christian Democrats have policies that are similar to the Sweden Democrats and it would be relatively easy to join the three parties into a coalition. The national elections of 2018 have not meant a breakthrough for a revolutionary alternative. The workers and their dissatisfaction keep being locked within the framework of capitalism, regardless of whether it is in the Left Party or the Sweden Democrats. 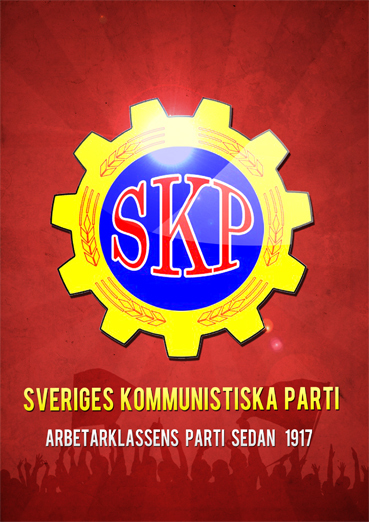 The campaign that has been conducted by the Communist Party of Sweden has been aimed at the entirety of the system in which we live: capitalism in its imperialist stage. We have emphasized that there is more that unite the parties represented in parliament than separate them: they are all parties that do not challenge the capitalist system. Even though there are differences in nuance between them, their support of capitalism, and all the problems that are caused by that system, remains at the core of their existence. Our campaign and our political approach have been clear. We have not compromised with our ideology, or espoused illusory ideas of “lesser evils”, nor have we called upon people to support capitalist parties. Our participation in the elections has allowed people to take a stand against the entire system, both on a personal and political level. Because of the limitations put on extra-parliamentary parties, we do not get our ballot papers distributed to polling stations. That means that every Communist Party ballot paper that reached a polling station was put there by a communist. This time around more stations were reached than in previous elections, but unfortunately this still constitutes only a fraction of the total. Unlike the bourgeois parties we do not get any kind of support from the state. That means that every leaflet and every piece of information were distributed by a communist. In all of this, we have grown as a party, as an organization and as communists. We take our experiences with us, and will continue to build our party. After all, voting is not enough – the work communists do outside of parliament is at any given moment more important than what is done inside of it. That is why we strengthen our continued struggle with the experiences that have been gained during our campaign. The contradictions between labor and capital will harden and in that struggle, the people have no other hope than their communist party!